8. We currently have 4 vehicles, that altogether would sit 30 people. 9. Our food budget each month is more than our mortgage and this is with couponing! 10. I figured-out that we average 5 extra people a day in our house that are not relatives. games just in this year. 12. I've spent over 300 hours reading to my children this year and it's been wonderful! OK, I'll stop now : ) Love and blessings to all my readers. This has been a great year blogging. I started last January when my husband encouraged me to go for it. I'm so glad I did. I've met some wonderful people and also had some great encouragement. Thanks for all this nice comments this past year. I don't think I got one negative one! I love the picture. Thanks for sharing you logistics. We are so close in family size and yet we use like 16-18 gallons of milk weekly and about 15 dozen eggs. I'm wondering now, maybe my kids just eat a lot!!!! And drink a lot!!! But I don't mind since the milk is raw and cheap and the eggs are fresh and local. You know I've never really thought about how much laundry is done around here each day. I'm going to be conscious about it for a few weeks and see where we are. Off the top of my head I'm thinking about 3 or 4 a day between both washers. Not really sure though since that's my girls' jurisdiction! Not sure if I've commented before or not, but I really enjoy your blog. I've always been fascinated by large families, even as a kid! I came from an "average" size family then, and have an "average" size family of my own now, but love to read about large families, especially posts like this! Happy New Year to you and your beautiful family! I love reading about your family! Thanks for sharing and can't wait to read more in 2011!! I love your blog and find it very encouraging and a blessing. I have a 10 year old son with autism, an 8 yr old son, a 5 year old daughter, and an almost 6 month old son. Wishing you a happy and fruitful 2011! Hi! I am a new follower from blogfrog. 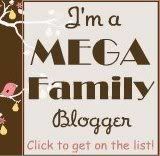 I am really enjoying your blog and your wonderful family! I can not believe I just set here and read your ENTIRE blog. I think God knew I needed this time because while my blessings were outside stacking wood I set here and read. I have homeschooled for 8 years and love it. What a beautiful family! I love this list of family facts. I thought I went through a lot of milk (about 3-4 gallons a week) with my 4 boys. Luckily, we're set for eggs because we have our own chickens. Maybe I should also get a cow? I've really enjoyed reading your blog. I realized I hadn't become a follower yet. So, I made sure to do that on this visit. I am just shaking my head. You just have a God-given grace to do it all. I cannot imagine. I'm glad you're blogging. I've been blogging for 3 or 4 years and I love it.